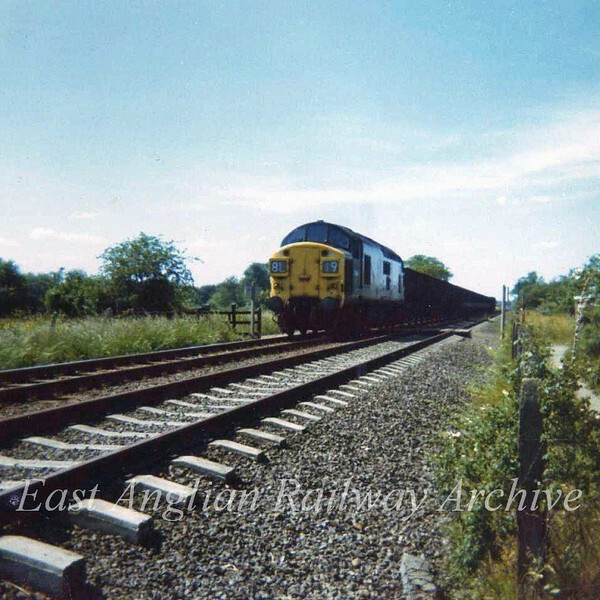 37083 on an up sand working between Girton Road Crossing and Histon on 13th June 1974. Note the concrete Dowmac sleepers on the up track which were installed on an experimental basis on this line. The train is passing an occupation crossing and a footpath to Girton. Single line working is in operation on the down line. To the left of the engine was a stile leading to the footpath. This was a favourite haunt for me, aged about nine, at the end of steam traction, in about 1961/62. My best sighting by far here was Patriot, 45541 "Duke of Sutherland" running light engine towards March.